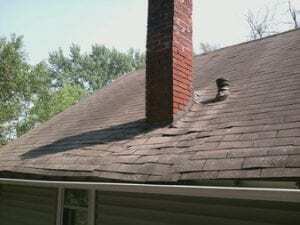 Problem: Leaking through the roofing system around the chimney area of the roof. Solution: Re-flash the chimney to roof transition. The flashing is improper or failing, causing water to penetrate into the roofing system. Remove the existing roofing around the base of the chimney, replace damaged wood decking, install ice and water shield underlayment, apply shingles and aluminum step flashing, apply new custom aluminum counter-flashing cut into the brick of the chimney. As in this photo, chimney flashing failure will lead to damage to the roof decking and to the interior finishes, resulting in a more expensive repair if not addressed at the first sign.